There are various types of mirrors that can be used in bathrooms however choosing a mirror which suites the theme of your room is most important. 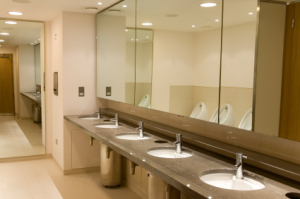 In some circumstances small mirrors can be effective while in many other applications a large bathroom mirror will provide benefits beyond that of a small mirror. The most common shapes of mirrors are square, rectangular or circle but mirrors can be cut to suite almost any shape room or wall.